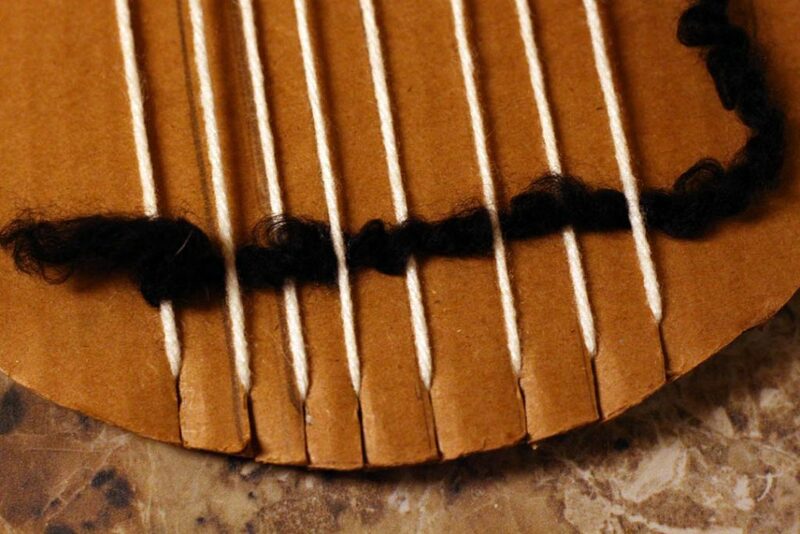 To begin, cut yourself a piece of cardboard to make your loom. I already had a circle of cardboard cut from another project, so I was lazy and just used that. 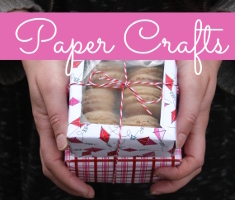 It honestly doesn’t matter the shape, just cut a rectangle, or square. Mine was about 12-inches in diameter. 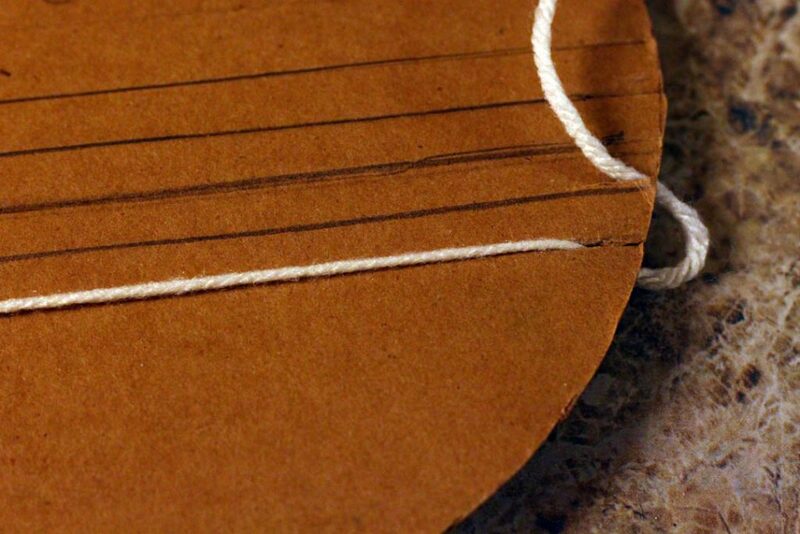 The side of your finished woven piece will depend on how many strings across you make, and how long you make them–so cut your cardboard with the final size of your woven piece in mind. 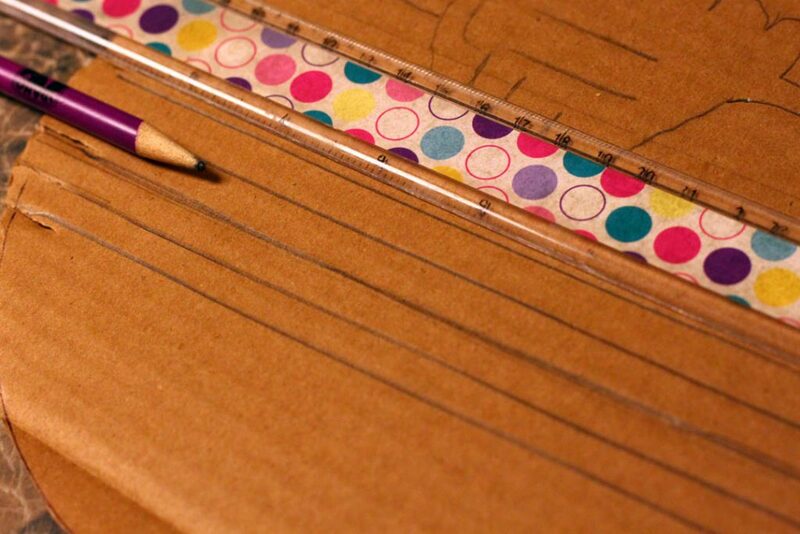 Use your ruler and pencil to make an even number of lines clear across your cardboard, so they touch both the top and bottom edge, spacing them 1/2 an inch apart. 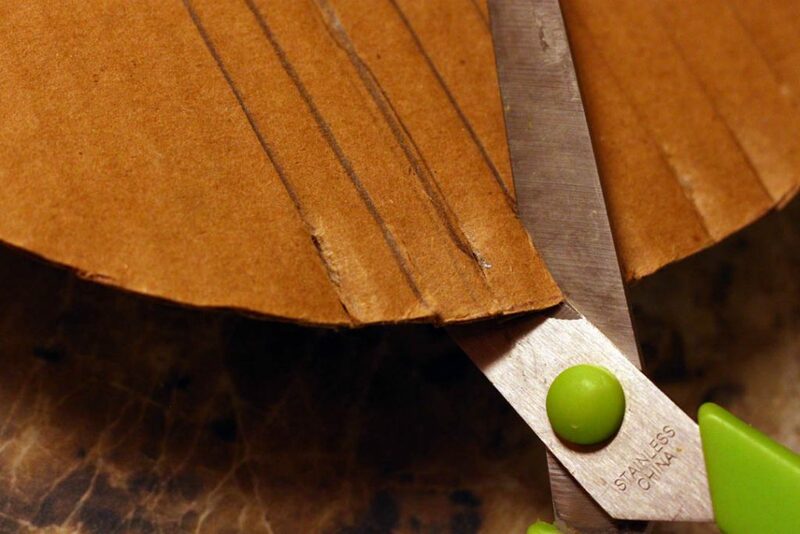 Using your scissors, cut down into the cardboard about 1/2-inch on each pencil line–do this on both edges. 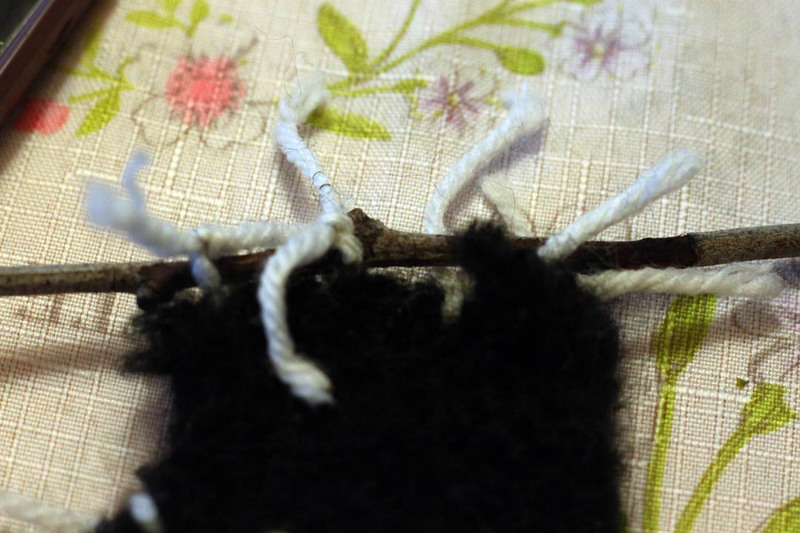 Take one end of your yarn, and place it between the first cut on one edge of your loom. 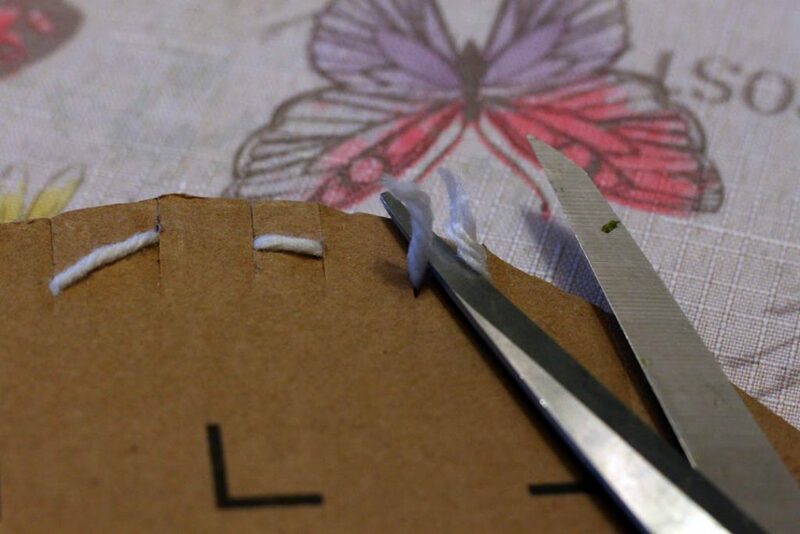 Leave about a 2-inch tail, and tape it into place on the back, if you desire. Take the yarn across the loom to the slit directly across on the opposite end , and draw the yarn through the slit to the back. 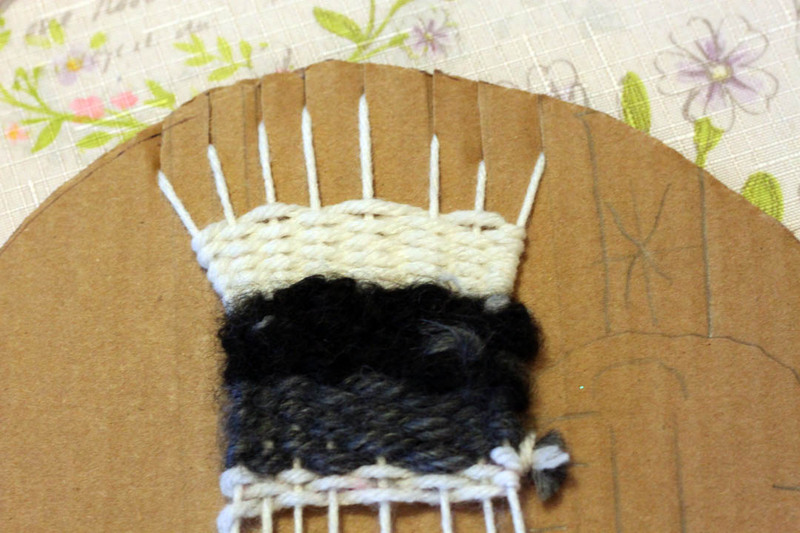 Next, staying on the same end of the loom, draw the yarn up through the next slit to the front of the loom. 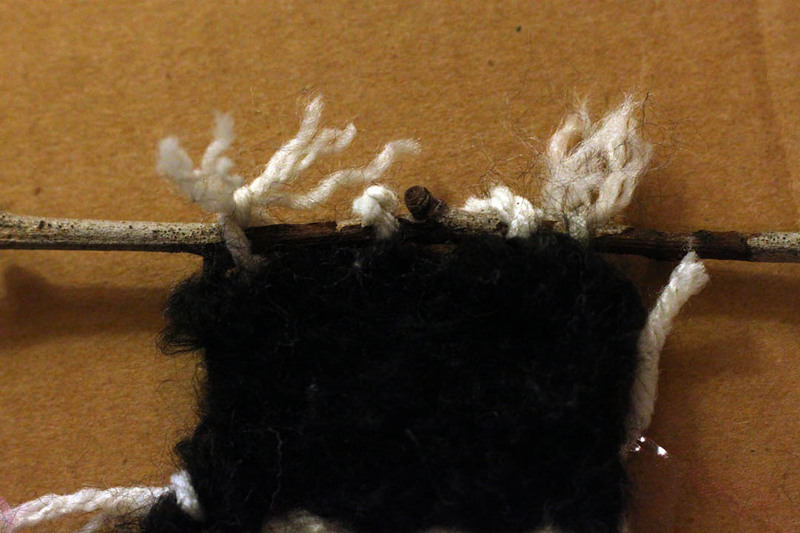 Bring the yarn back down across the loom to the slit on the opposite end. Pull the yarn through that slit to the back. Again, staying on the same end of the loom, pull the yarn up through the next slit over, and back to the front of the loom. 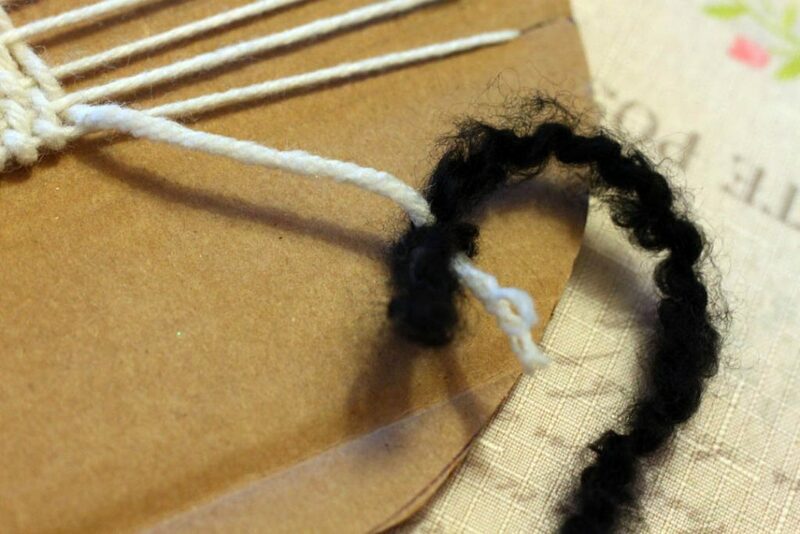 Continue this back and forth pattern until you have your loom completely covered. 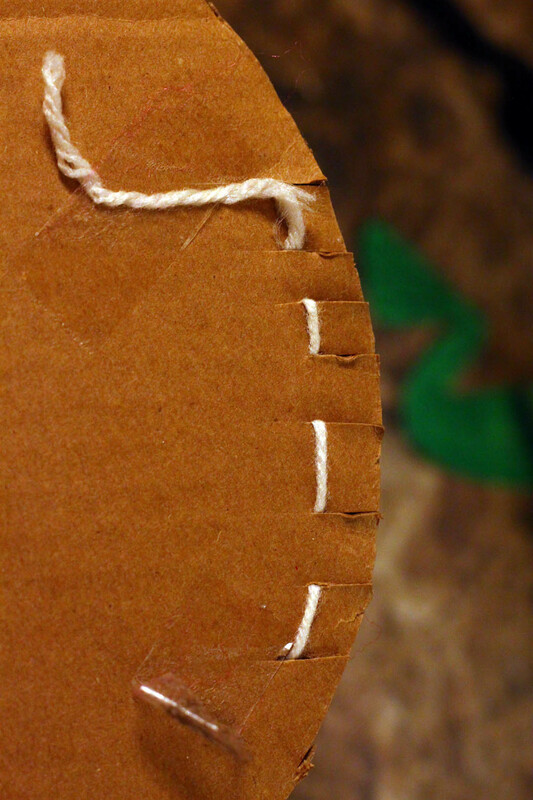 Cut the end of the yarn after drawing it through the last slit, and tape it into place on the back. 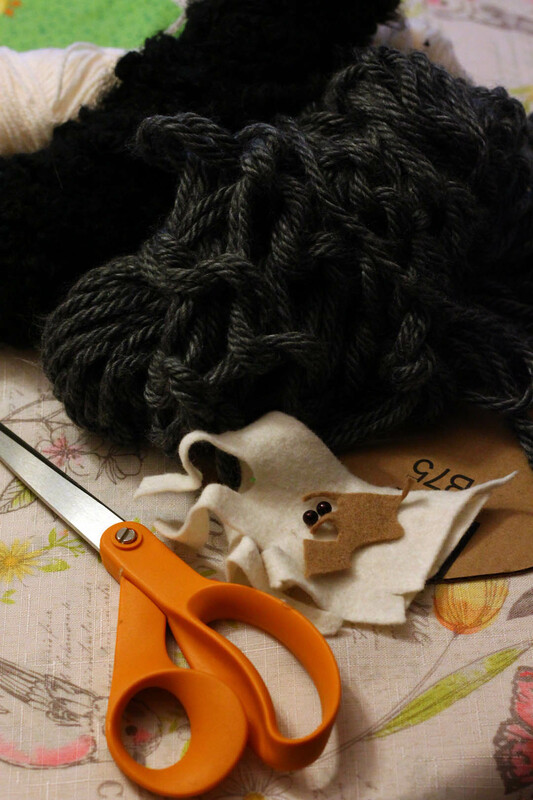 Make sure your strings are taut, but you don’t want to string them so ridiculously tight that you’re stretching the yarn. 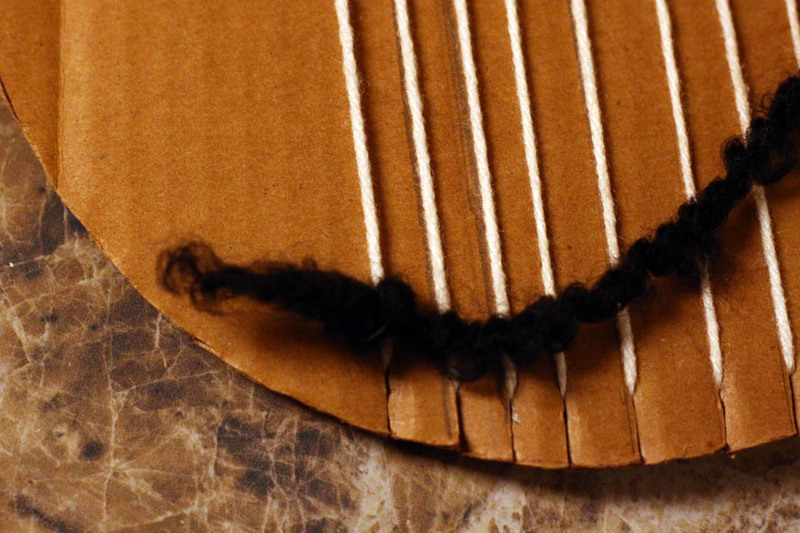 If you have strung these strings correctly, all your vertical strings should be on the front of the loom, and the back should just have little “dashed” lines along the top and bottom edges. Starting on the farthermost string on the bottom edge of your loom, tie your first piece of weaving yarn onto the vertical string. 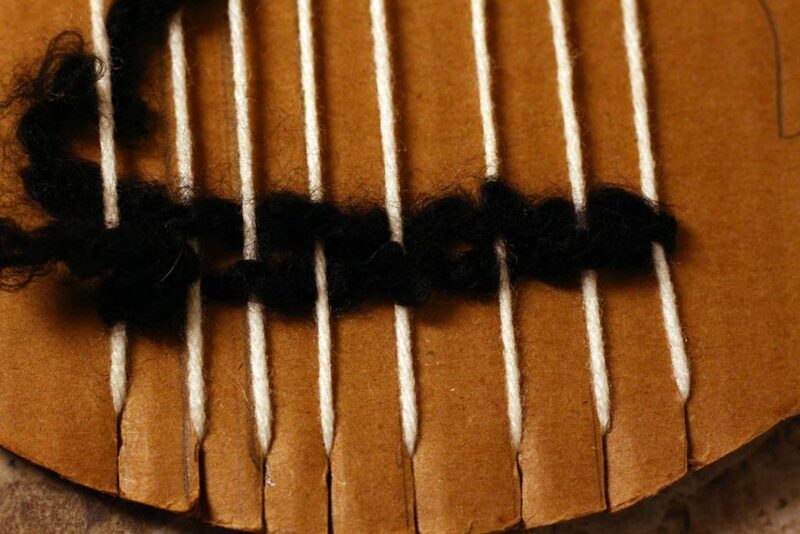 Now, begin weaving your yarn through the vertical strings–under, over, under, over, etc.. 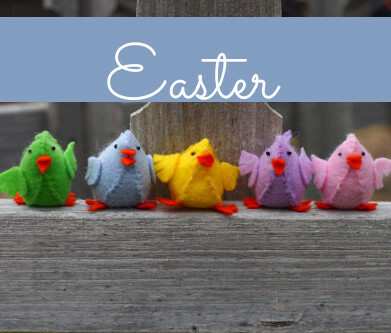 When you get to the end of the row, begin the next row by weaving it the opposite of the previous row–over, under, over, under, etc..
To change colors of yarn, simply tie another piece of yarn onto the first piece of yarn, and keep weaving. I wasn’t worried about making perfect stripes of color, but if you want to be more precise with your color changes, try to approximate how much yarn you need to finish the row, and then join another piece of yarn to keep your stripes even. 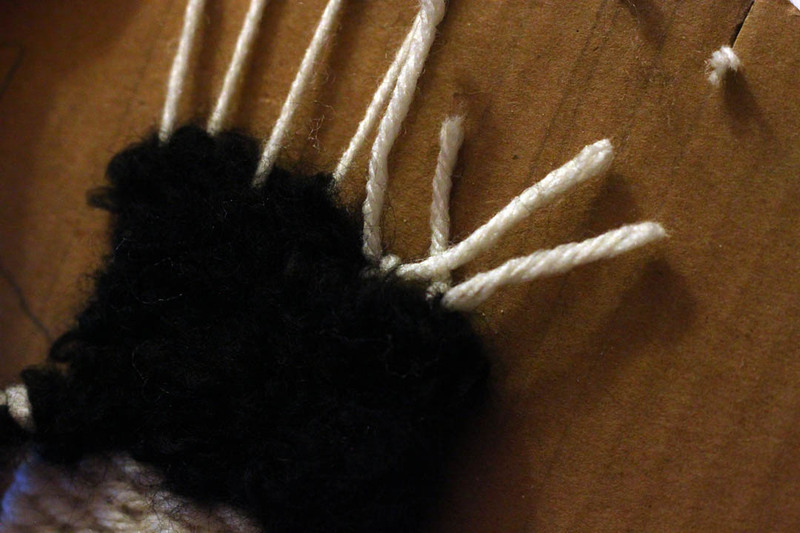 Keep weaving until your piece is as large as you want it to be. 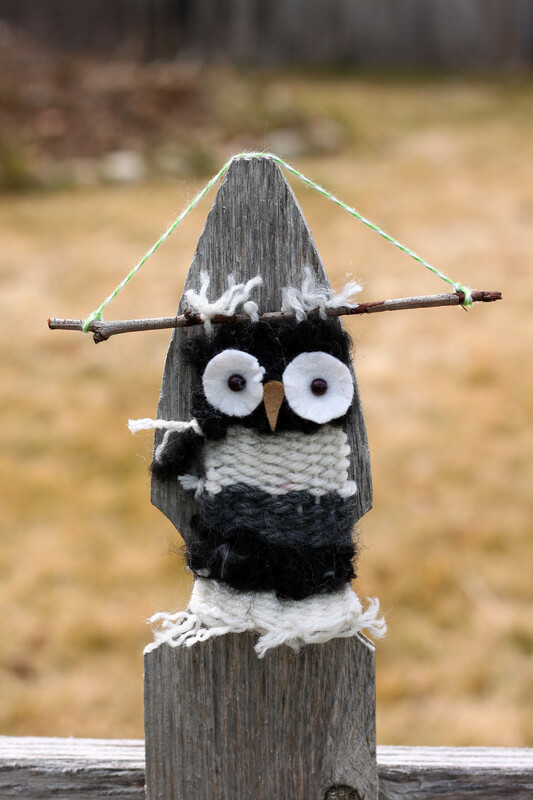 To make my little owl hanging, I took a small stick from my yard, and tied the little ties at one end of the woven rectangle to the stick to hold it on. 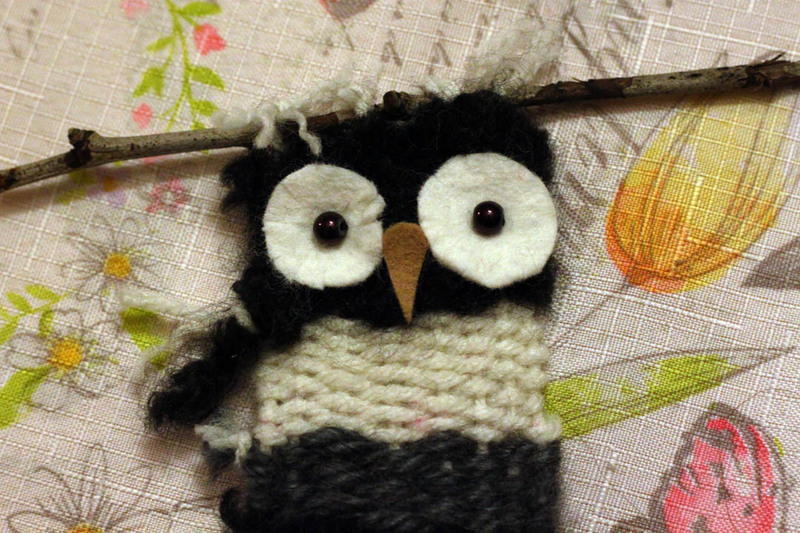 Next, I cut two small felt circles, and a little triangle for a beak. 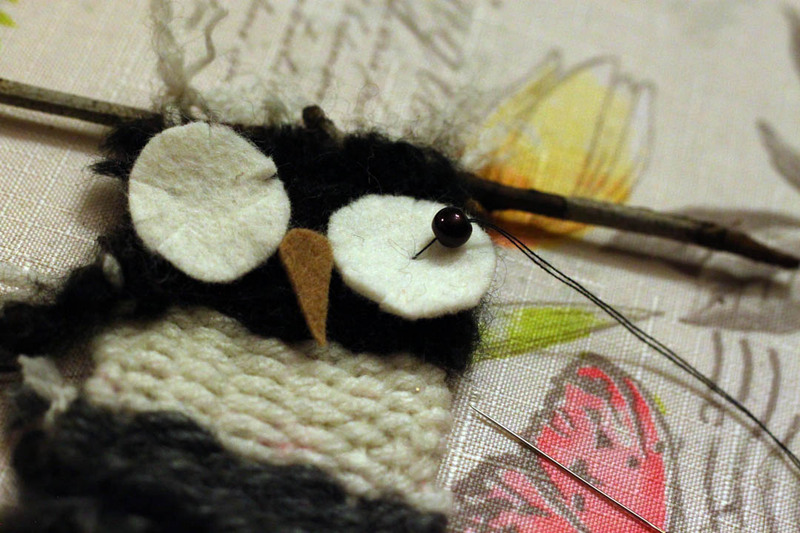 Using my needle and thread, I sewed one bead to the center of each felt circle to create the eyes of my owl, and onto the woven piece. 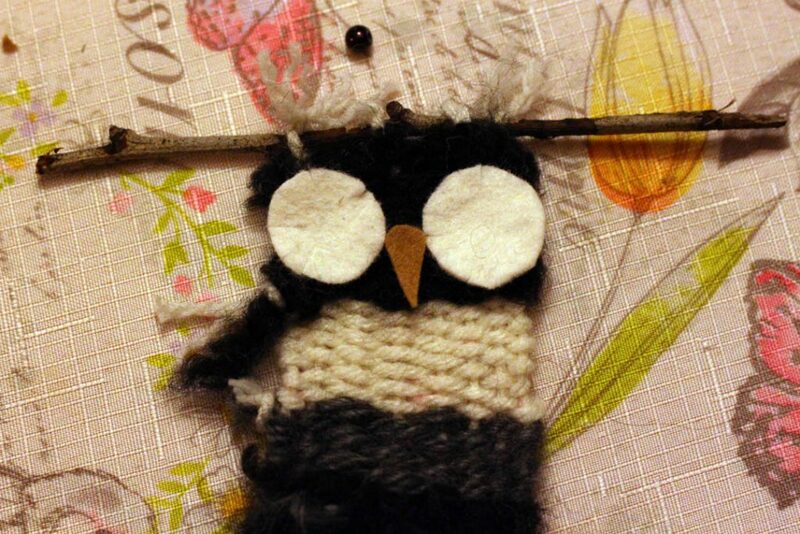 Glue the beak between the eyes. 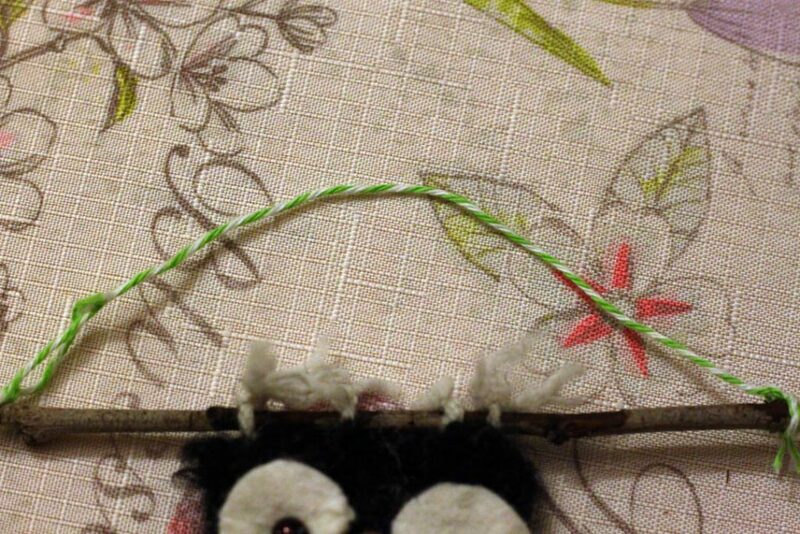 Tie a small piece of twine onto either end of your twig hanger. 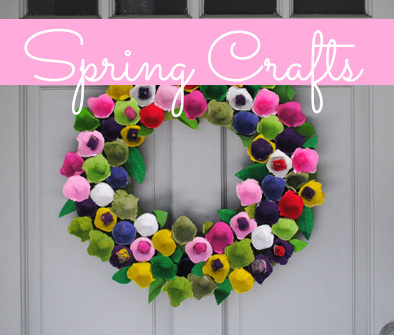 Now find someplace special to display your cute little woven wall hanging!